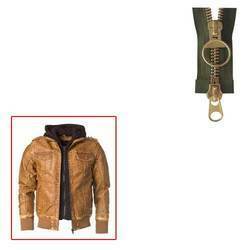 We have marked a distinct and dynamic position in the market by providing a high quality array of Brass Zipper for Leather Jacket. Manufactured by following advanced engineering concept as per the industry standards, offered zippers are checked on various quality parameters. Our offered zipper has become a rage in the fashion industry. Known for accurate functioning, these zippers can hold very heavy fabrics together. Looking for Brass Zipper for Leather Jacket ?